Group-IB combines a power of human expertise, rich data sources and unique technologies to get a first-hand understanding of intrusion tactics and malware samples used in most sophisticated cyber attacks. We apply our Intelligence Driven approach to analyze the threat actor’s activities and piece together a coherent attack kill chain to restore business continuity. We gather all necessary information for creating a list of Indicators of Compromise, write YARA-rules to clear your enterprise’s network from the infiltration. Our experts explore the anatomy of the attack — how attackers gained a foothold and moved laterally inside your organization to steal confidential data. After analysis, we prepare a detailed report on how to adjust your security architecture and processes to strengthen your security posture. Under the guidance of Group-IB experts your IT personnel implements Threat Detection System (TDS) for network traffic monitoring and suspicious behavior detection missed by signature-based cybersecurity systems. Group-IB specialists conduct express forensic analysis of workstations and servers used by cybercriminals to identify the initial attack vector, applied tools and techniques as well as exploited vulnerabilities. Our GIAC certified malware analysts perform basic or advanced static and dynamic analysis of malicious code discovered during an investigation to determine other affected assets in the environment and prevent further intrusions. For your peace of mind, rely on our Retainer service to get an emergency assistance and avoid delays “when seconds count”. Group-IB’s IR team is ready to provide an on-site service within hours to strengthen your security posture. ...At least one of the US Banks targeted had documents successfully exfiltrated from their networks, twice. The incomplete incident response by the other company was the reason for the second attack. 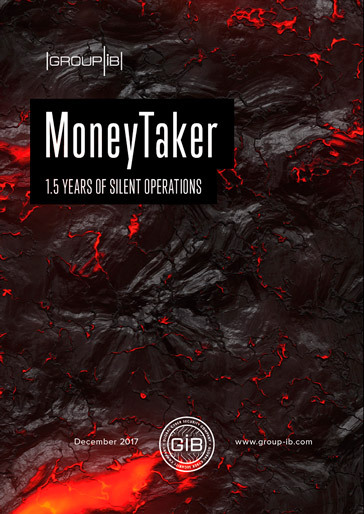 About 20 companies were attacked in the US, UK and Russia by MoneyTaker group from May 2016 to November 2017. The average loss from each successful attack was about $500 000 baseline.